I've never tried the to-go shop portion of the much beloved Tea and Sympathy, much preferring the restaurant for a civilized meal of sandwiches and tea served in dainty china. But you know how time goes, it flies. Those Brits sure know how to make a great tea sandwich. They do have centuries of drinking tea to perfect the art. 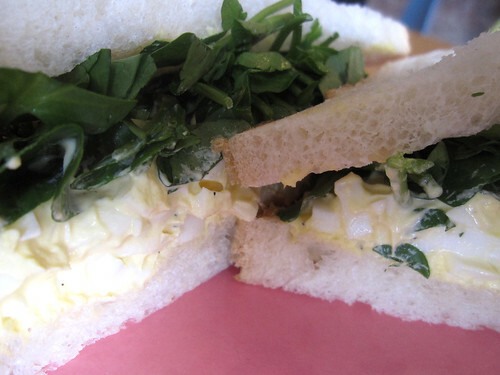 For me this is the perfect balance of egg salad, slightly bitter watercress and soft squishy white bread. gawd, i lovses you guys!! keep on keepin' on. thanks for taking the 'what do you feel like eating? dunno. what do you want?' right out of my marriage, it's great. Oh this looks mighty tasty. Love a tea sandwich, anytime!